Club Penguin Cheats by Mimo777 Club Penguin Cheats by Mimo777: Club Penguin Message From Rookie! 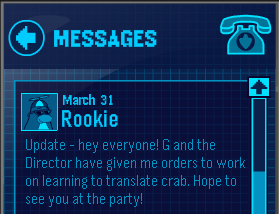 How did Herbert find out how to translate crab anyway? Hey mimo cant login to club penguin. IT just wont load after loading 9/10 of content. This has been happenging today and yesterday! Hey Mimo! LETS FIND ROOKIE IN THE BOX DIMIONTION! SOME PEOPLE MEET HIM AND ITS NOT FAIR! I met Rookie! I got his background and stamp... they look really cool and Rookie was SOOOO funny lol! Anyways why doesn't G just make a new Crab Translator 3000!? omg! the spinning room is back! Dont try check on only English server, check on the different languages. I met him at Deu Branco at Portugese. You maybe lucky. He is darker than normal green. not dark green. When you hear a "ting" sound, its him. Hey MiMo,are you going to put the new catolog on this site?, to show where things are hiding. When i met rookie, he hid from me cuz i was in a crab suit. he screamed and said "hide me from the crab!" Club Penguin Super Foolish News! Club Penguin Helper Reviewed By You! Club Penguin Raises Membership Rates! Carl The Hamster In Club Penguin?! Club Penguin Field Op Number 38 Cheats! New Dance Lounge and Game! Club Penguin Message From G! Herbert P. Bear Sends Message! 2011 Club Penguin Puffle Party! Rookie To Be At April Fools Party? Club Penguin April Fools Party HERE NOW! Club Penguin Adds System Defender Stamps! Club Penguin Adds Brown Puffle To Puffle Roundup! Club Penguin Parent Portal Test App Released! New Club Penguin Game - Bits & Bolts! Who In The World Is B & B? Club Penguin April Fools Party Boxes! Club Penguin Field Op Number 37 Cheats! Club Penguin's Wackiest Start Up Screen EVA! Club Penguin March Parent Update! Club Penguin Arcade Games Reviewed By You! New Club Penguin Puffle Postcards! A New Club Penguin Times Is Here! Club Penguin System Defender Director Level! Club Penguin Puffle Launch Is HERE! Club Penguin Field Op Number 36 Cheats! Club Penguin Happy77 Posts Puffle Video! Club Penguin Puffle Games Reviewed By You! Club Penguin Bean Counter Update! Club Penguin Another Message From G! EXCLUSIVE- New Club Penguin Commercial! Club Penguin Message From Herbie! Club Penguin Field Op Number 35 Cheats! Happy77 Adds Another Puffle Video! Club Penguin Start Up Screens! New Club Penguin Pet Shop Now Open! Club Penguin Puffle Sneak Peak! New Club Penguin Message from G! New Club Penguin Puffle Stuff! Club Penguin Pet Shop Sneak Peek Reviewed By You! Club Penguin March Membership Page! Club Penguin New Puffle Game and Other News! Club Penguin Field Op Number 34 Cheats! Club Penguin Message From Jet Pack Guy! Club Penguin March Pay Day!